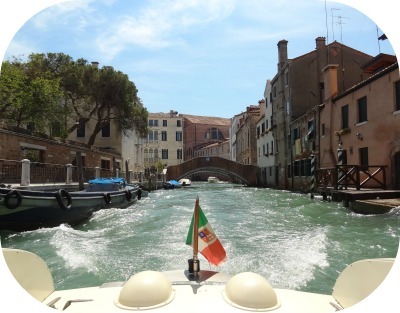 Venice Italy Tourism Escape, Venice To crowded? Every year 30 million tourists visit Venice. Walking through the alleys, over the bridges and crossing the canals. Especially in June, July or August. The narrow streets to the Rialto bridge and the Piazza San Marco are overloaded with Venice Italy Tourism, souvenir vendors and pigeons. And the charm of the Grand Canal disappears in the noise of its own public transport boat ‘the vaporetto’. Actually, I don't like crowded tourist places. And yet... 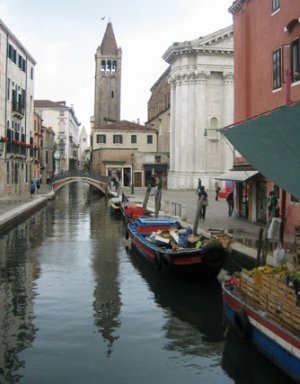 I have visited Venice several times, in different seasons. Despite the overloaded Venice tourism,, the incomparable beauty and emotion of Venice Italy keeps me return. Therefore, it is good to have e-tickets in advanced or just buy them 10 before your museum visit. For this hidden pleasure you need to move yourself through the lagoon of Venice. Taking the ‘vaporetto’ no. 11 (Lido < - > Chioggia) you have a great tour through the Venice Lagoon.And above all, you rarely see tourists. These islands and villages give an impression of life in the lagoon as it was lived for centuries. Hump from island to island, look around and experience the magic of real Venice Italy, the quays and harbors and breakwaters in the sea. I think the beauty of a place is the reason to come. Venice Italy never looses its soul. Especially when you're on a boat in the Venice Lagoon. One of the nicest Venice Italy tourism escape! Murano, the island of glass, Burano, the island of lace, and Torcello, the quiet island with the old church of Santa Maria Assunta. You take the LN route "Laguna Nord": Several types of boat operate on this route to reach these islands. You take line 12: From the Fondamenta Nove station in Venice. This line runs with vaporetto boats to Murano-Burano-Treporti-Punta Sabbioni. From Venice it’s a beautiful ferry ride. The LN route is wheelchair-accessible. I took the LN route from S. Zaccaria station (near San Marco), this is also possible. Tip: If you're staying at one of the campgrounds near the Punta Sabbioni (PS) for example; Union Lido Camping Park & Resort, Line 12 will get you to the city center in about 60 minutes. Choose from Punta Sabbioni line 15 to Venice S. Marco - S. Zaccaria. This takes only 35 minutes. My favorite areas without tourism are small empty squares. These sights you will find when you are wandering through the alleys. Other places where you can find peace are the Venice churches. They are everywhere and they are all open! I tried it... 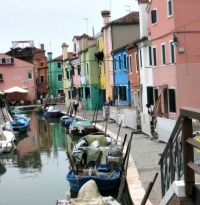 Escape the Venice Italy tourism... You should try too... It feels good when you feel and enjoy all what Venice has... Rediscover the ancient Venice, the silent Venice and the Venice of Casanova, of prostitutes and foreigners, from sailors and sultans, art and music. I gave you my experience on Venice Italy tourism. I have some suggestions, as you will read. Please click on the links to explore my site more and get even more information about the different topics.